There is an incredible number of different plants in the world. Humans separate plants according to particular traits. Some of the most important differences between plants are whether they have seeds or vascular tissue. Plants have been grouped into twelve different phyla depending on these characteristics. 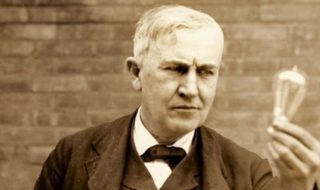 Incidentally, learning about the types of plants also takes us on an evolutionary journey as plants emerged from aquatic systems and increased in complexity. 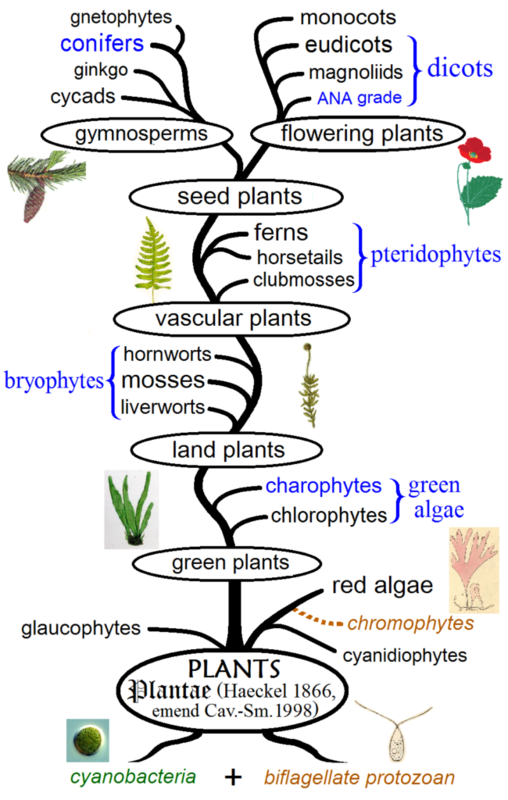 The different types of plants represented in an evolutionary tree. Image credits: Maulucioni. Algae: There are three different types of algae: red, green, and brown. They live in water and, for this reason, are considered primitive plants. All plants started off growing in water, and as single celled organisms. More evolutionarily advanced plants left the water. Algae are photosynthetic organisms that range from unicellular organisms to large multicellular forms. Liverworts are small plants that grow in damp environments. They do not contain the vascular tissue that transports water from the roots to leaves, which is why liverworts are usually very small and need to live in moist places. Liverworts grow simply by expanding themselves. They do not have a true root, stem or leaves. Hornworts are similar, but have a sporophyte, which is a horn-like structure. 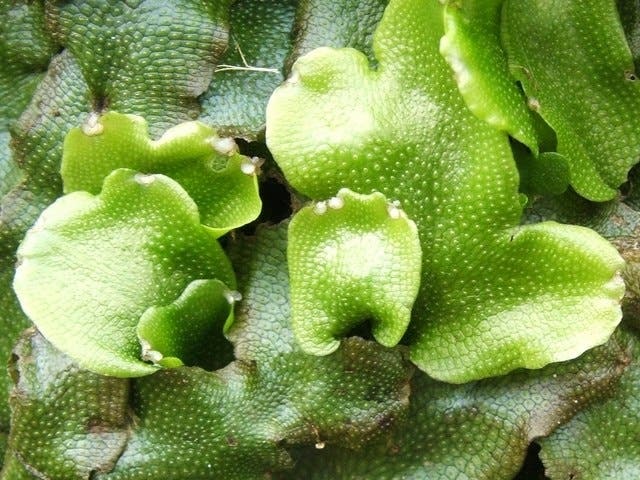 A liverwort. Image credits: Lairich Rig. 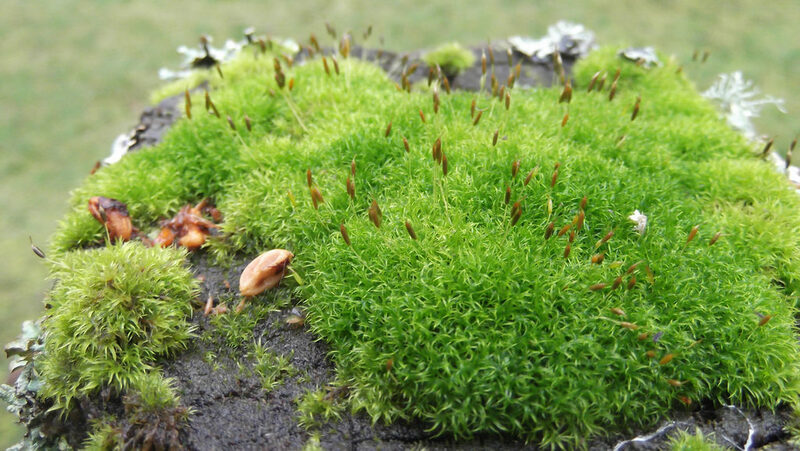 Mosses are close relatives of liverworts and thrive in similar environments, damp areas near water sources. However, they do not require soil to grow, which is why you can see rocks and trees covered in moss. Mosses grow apically — in other words, stems grow from their tips or other special points on the stem. Flowering plants also grow this way. Mosses growing on rock. Image credits: brewbooks. Ferns need wet environments to reproduce so the sperm cell can swim to join with the egg cell. A new fern develops from the resulting zygote. However, ferns can survive periods with less water better than mosses and worts. 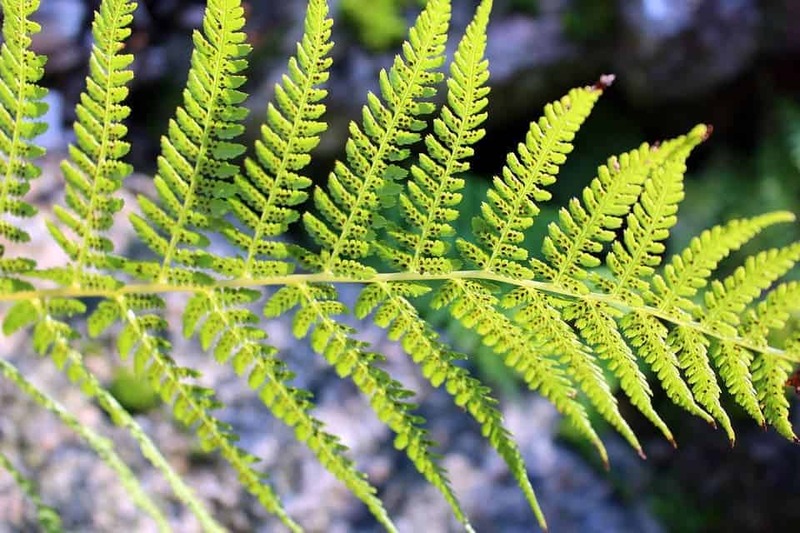 Millions of years ago, ferns dominated the land and were the most common plants. There were massive fern forests. The underside of a fern, showing the spores. Image credits: Pixabay. There are several other plants that have vascular tissue but lack seeds. Whisk ferns are primitive ferns that lack typical plant organs, such as leaves. Clubmosses have branching stems with simple leaves. Horsetails, also called snake grass or puzzlegrass, are found in the only extant (still living) genus in its family. More species within the same family existed millions of years ago, including very tall trees. Club mosses and horsetails are considered fern allies since all of these plants reproduce by spores and not by seeds. 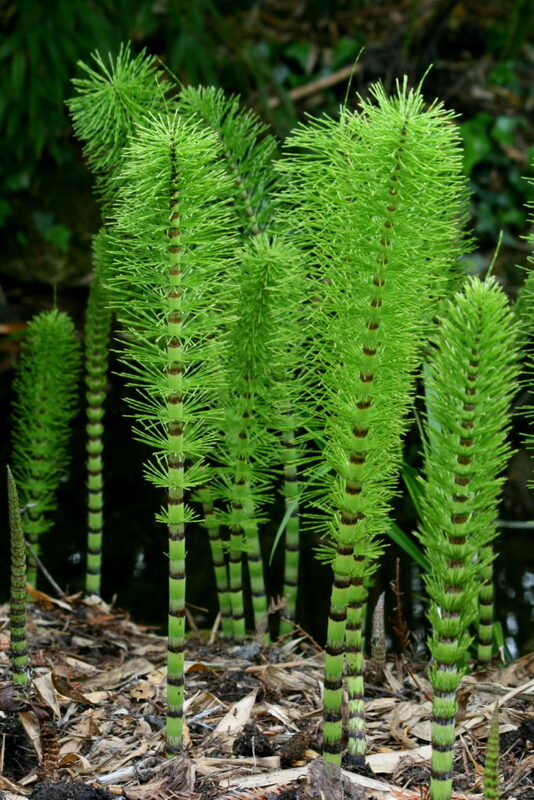 Horsetails are a very ancient type of plant. Image credits: Rror. 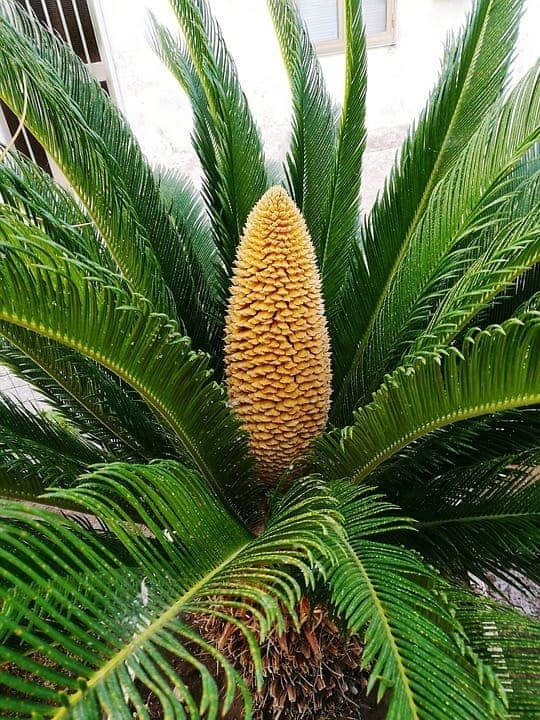 A cycad. Image credits: Pixabay. 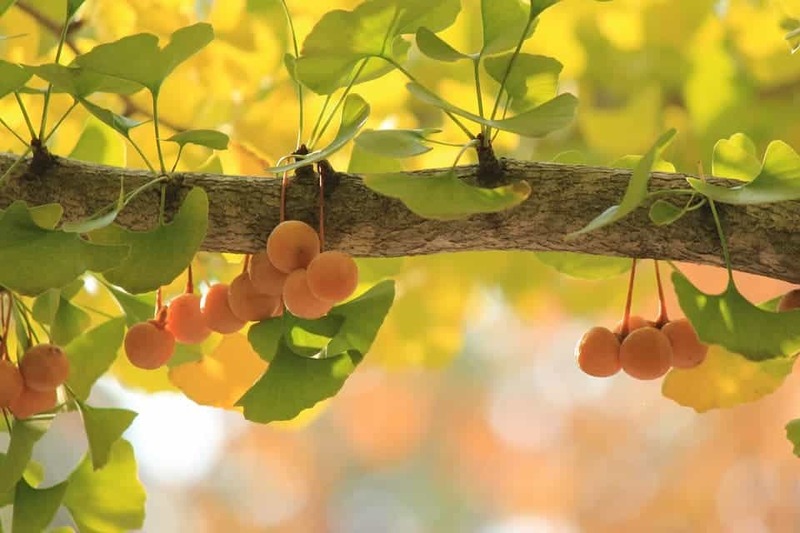 There is currently only one ginkgo species in existence, Ginkgo biloba. 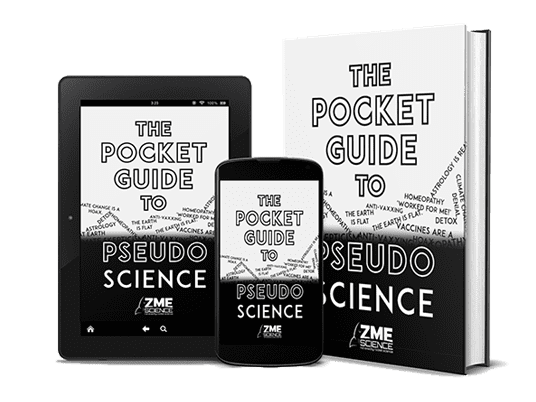 It has not changed very much since the Permian period — when it covered large parts of the world — and is therefore called a living fossil. They have fan-shaped leaves, and trees are either male or female. They produce fleshy seeds that have a strong odour. Ginkgo is only found naturally in central China, but has been purposefully planted in gardens and parks around the world. Flowering plants, however, are outcompeting it. A gingko tree. Image credits: Pixabay. The phylum gnetophyta is also a gymnosperm and consists of three genera that are not closely related. 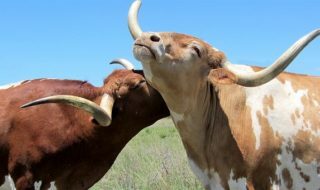 There are about 70 species in total. Ephedra is the largest genus, and its plants grow in deserts. 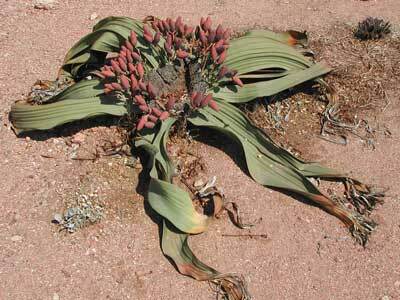 Welwitschia plants grow in the desert in southwestern Africa; they have long, thin leaves. The last genus in the phylum is the namesake called Gnetum. A plant from the Welwitschia genus. Image credits: Bries. Conifers have woody trunks and produce cones with seeds. 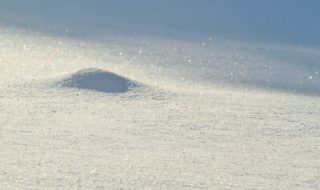 They grow mostly in cold northern climates and keep their leaves throughout the year. Conifers have naked seeds that are protected by cones, and the male and female cones are produced on the same tree. The pollen cones are male and produce the pollen that is spread to the female gametophyte found inside the seed cone. Seed cones are female and contain eggs on scales that form seeds when fertilized. 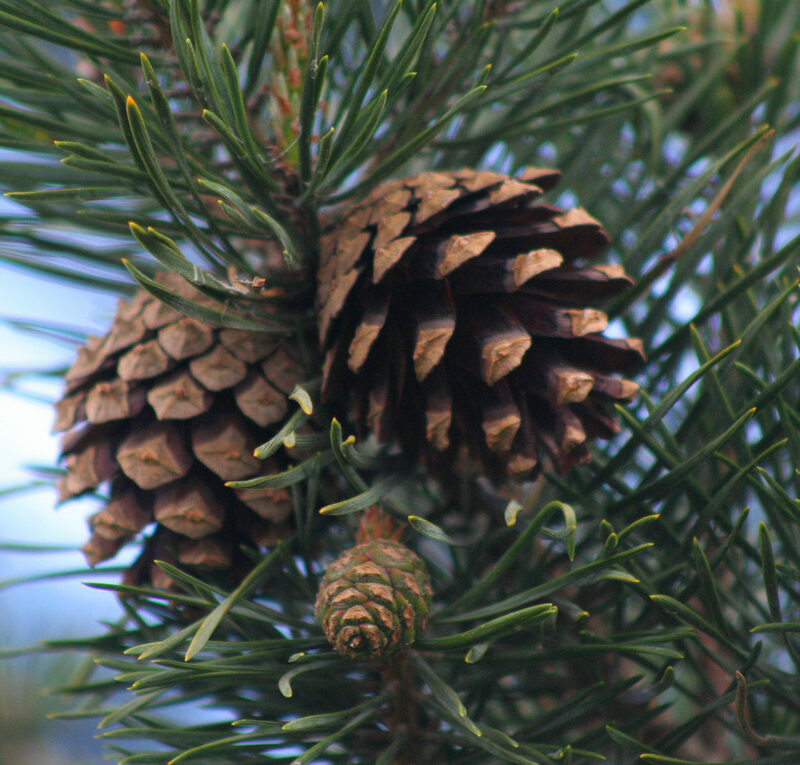 Conifers have seeds in protective cones. Image credits: John Haslam. 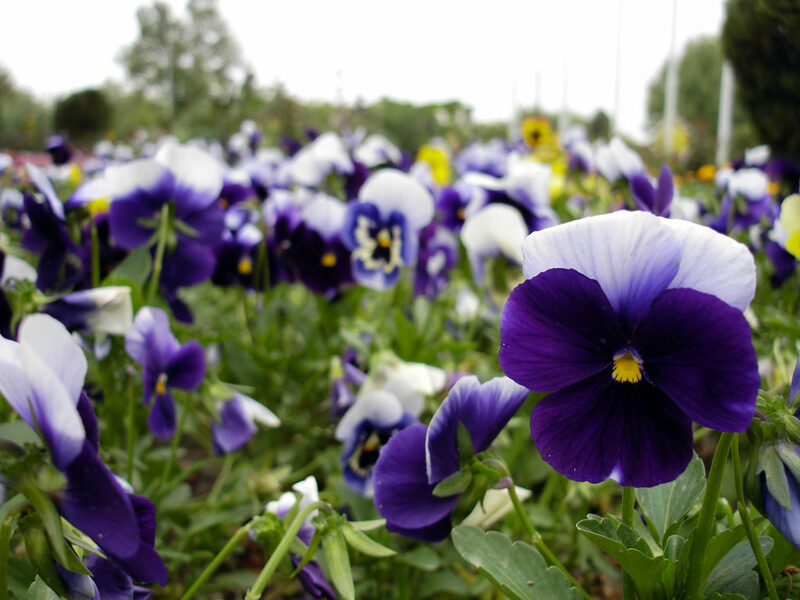 Flowering plants, also called angiosperms, have male and female parts. The male parts produce pollen that is dispersed, and upon reaching the female parts produces an embryo that develops into a seed. Wind and pollinators, like bees, can pollinate these plants. Angiosperms produce flowers and fruit, and the seeds are produced and protected within this fruit. Angiosperms are divided into two groups. Monocotyledons (monocots) have one seed leaf, while dicotyledons (dicots) have two seed leaves. Monocots have parallel veins, scattered vascular tissue, and flower parts that grow in multiples of three. Dicots have net-like veins, vascular tissue in rings in the stems, flower parts that grow in multiples of 4 or 5, and are often woody. Angiosperms form the plant group most equipped to handle dry conditions, which is why they are now the most widespread plant type. Flowering plants. Image credits: Mostafameraji. We are now living in the era of flowering plants. Evolutionarily, they are the most advanced and they make up the largest proportion of plants in the world. There are still many other diverse plant species that grow alongside them.